I’ve never had a dedicated writing studio. I write wherever I can find a little space and a little solitude. But I do dream of one day having a writing space where creative magic is nurtured by the beauty of the space and it is decorated with a dash of childlike whimsy. The place I’m currently renting is a basement apartment that I share with my sister and three very demanding cats. But I am lucky enough that my bedroom can accommodate my bedroom furniture and my small writing table. It is an entry-level basement which means we are blessed with full-sized windows and my room has two that look out into the back garden and the mountains beyond. The only downside is that I write in the mornings and the windows face east. It was impossible to write with the blinds up as the sun was directly in my face. The simple solution would be to keep the metal blinds closed when I write, or it would be if I didn’t have three cats. If you’ve ever owned even one cat you will understand the futility of trying to keep them out of any room they decide they want to hang out in and a closed door is a definite invitation to bat at it like a pugilist or as my one cat does, throw his whole body at it making it rattle in its frame. It’s enough of a challenge to write while you have a cat walking across the keyboard (cats can be such critics of the written word) or draped over your forearms as one of them is doing now as I write this. But my feline companions also think closed Venetians are the best cat toys in the world. After spending several months pulling cats out of bent and twisted louvers or having to reinstall the blind because they pulled it off the window I resorted to taping up thick blotting paper on the panes while leaving the blinds pulled up. That inexpensive solution did the trick, the sun was off my face and the cats ignored the windows. But after two years, the tape I used to secure the paper had dried up and the paper has curled with age. I wanted something a bit less utilitarian than paper and tinfoil screamed white trash, so I decided to install frosted privacy film on the windows. I was going to choose something simple, maybe with a bit of texture but when I went to the hardware store and looked at the choices, I did an unexpected thing. Along with frosted textures and understated designs there were two patterns that I can only describe as faux stained glass. One featured magnolias, the other clematis and both bordered on the tacky end of the design esthetic. But there was something about them, their vibrant colours and as a gardener I can’t help but love flowers. My first choice, the simple frosted white ones suddenly looked institutional. But now that I’ve installed them I know why I made those choices and why they are perfect for my room. 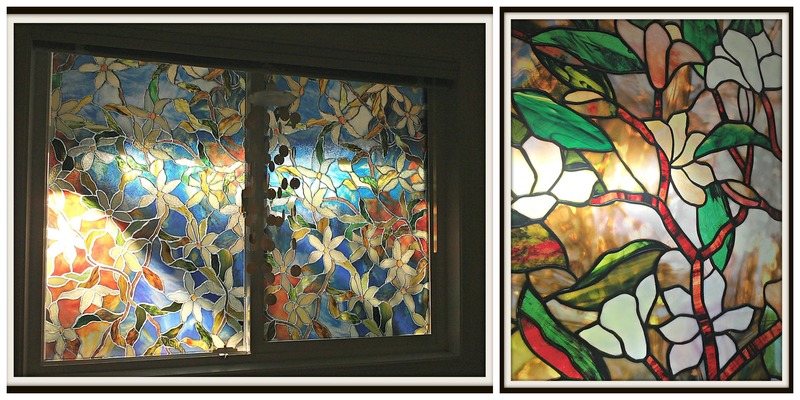 They may be fake stained glass but they transformed the space in which I write into a sacred space of creativity. The quality of light that now streams in, in the morning makes the room feel magical and a little bit whimsical. In fact, a perfect place to write.